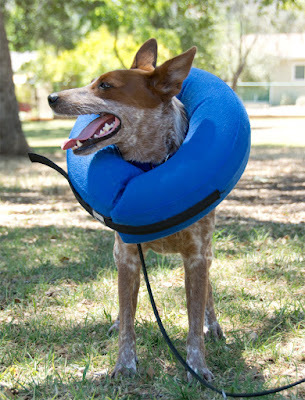 Kong's Cloud Collar is an inflatable alternative to those big plastic lampshade cones. It comes with a soft machine-washable cover, and does not leave bruises when your puppy smashes it into your leg. Comes in five sizes (ours is a Large). I used this collar while Sisci was recovering from her spay surgery a few months ago. I had originally tried a soft head cone for her, but it was too scary for her to move around in. The Cloud Collar doesn't obstruct her vision or make the world sound weird, so she was perfectly happy to wear it around the clock for three weeks (The clinic said two weeks but I was feeling paranoid). I had thought that this size large collar was significantly larger than the recommended size for Sis, but according to the package it is exactly the right size. It works just like the ZenPet Procollar, but the Cloud Collar is a bit bigger and I feel it provides more protection. Pros: Way more comfortable than a rigid or flexible head cone. Does not obstruct vision or impact hearing. Can size up for more protection. Easy to store when deflated. Cons: Not as reliable as a big plastic head cone, pet can still reach some parts of their body. Can be popped and then provide no protection at all. Bottom Line: Sisci can be spooky about backpacks and other bulky things that I make her wear, but she literally does not notice the Kong Cloud Collar. I purchased this collar after my dog had major surgery because the cone is huge and yes it's better .but he bangs into everything and he was very upset ...so I said let me go out and try this collar... he was groggy the second day after surgery.. so I put it on him just for supervision. he had major surgery like a tumor removed.. 40 stitches.. but I wanted something I could supervise him while I'm home watching him so he could have freedom to drink water and eat and not feel so cumbersome ...I got a medium he's 42 LB it fit very snug....great. looks like he couldn't turn around... his wound is on his back leg more on the upper body .I sat on the couch...he laid next to me... I looked away for a second and his whole head was turned around and he was ready to lick open his brand new surgery. He got a little of it. didn't even stop him from reaching it ..he's a 42 pound dog .he's not big... if I did not supervise him with that on.. he could have bled to death and people are saying it's the greatest collar after surgery and it's horrible to use a plastic cone ...well whoever wrote that .. not in this case.. that's for sure...not after major surgery no way ...not even with supervision ..you've got to have the stupid cone on them if you don't want to be rushing them into an emergency room bleeding . this was only the second day after surgery that could have been a disaster ..it might be good for certain areas.. but definitely not a major surgery .even supervised.. I brought it back.. put his cone back on him ...only take it off when I walk him.. but he's got to have it on ..it's a nuisance ... I feel so bad I really do ...but we have to endure it..